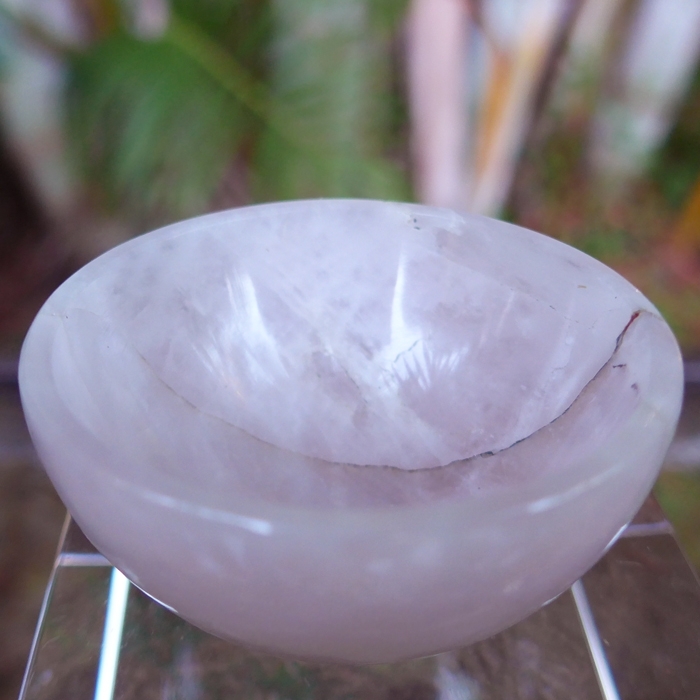 Dimensions (HxWxD): 1" x 2" x 2"
This gorgeous hand cut Rose Quartz Bowl is polished and translucent and emanate a soft rosy glow. 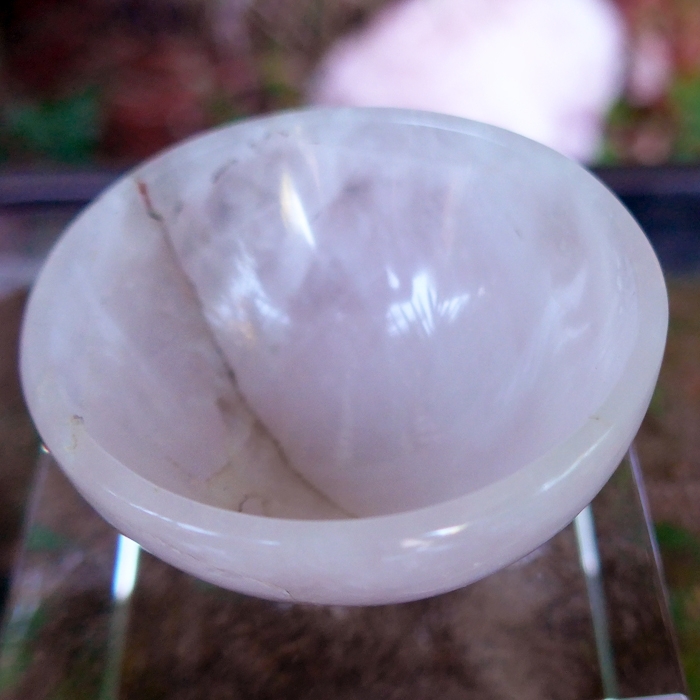 The diameter of this bowl is two inches, reaching a height of approximately one inch, so it is large enough to hold a small flower or simply water and can be placed on your altar or a display shelf or window sill in your home. You can see a naturally occurring inclusion in this lovely bowl, which mainly does not reach the surface. It is not a crack. Rose quartz projects a soft, soothing, gentle energy that is attuned to the energy signature of the open heart chakra, and resonates with vibrations of love. 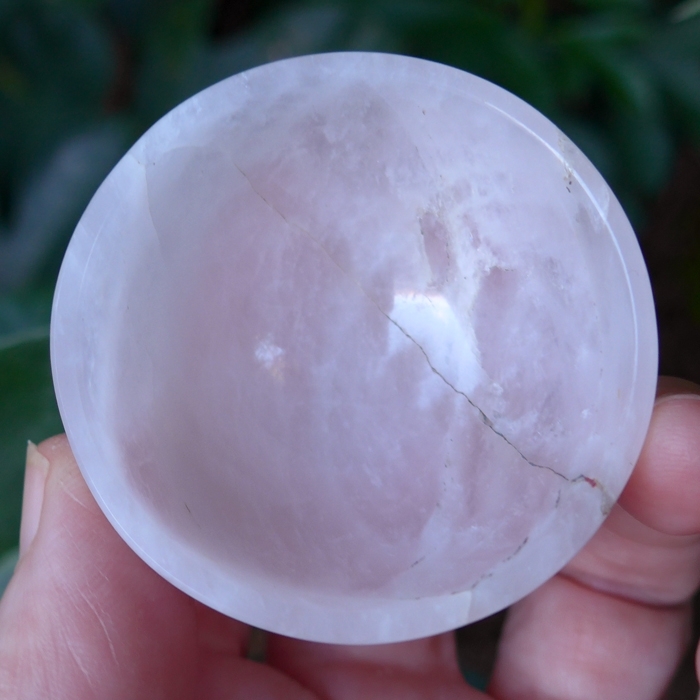 Rose quartz is especially supportive in cases where an individual is developing the capacity for self love. It sends out an energy of unconditional love, as compared with passionate love, so the energy of rose quartz resonates with the heart chakra rather than the lower chakras. This crystal has been cleaned with Universal Life Force Energy, and given an energy attunement using Reiki, a Japanese technique of energy healing, so it will continue to receive and transmit Universal Life Force Energy direct from the Source of Creation. It is ready for you to program according to your own needs and desires. Use this powerful crystal with loving wisdom and respect its journey in the Earth for many long historical cycles which has developed its unique metaphysical properties and beautiful appearance.. Note: Net weight is 1.65 oz.